Yeah! I hope you're going to tell us that you're going to be having challenges again!! Are we Fusion-ing again? yay! Love the card! 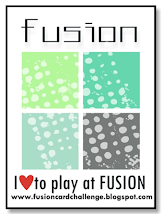 Hope this means Fusion is back!